WWIIReenacting.co.uk Forums • View topic - Children in Reenacting, asset or liability! Children in Reenacting, asset or liability! Post subject: Children in Reenacting, asset or liability! On some other Forum ,far far away there has be a post put on about copy cat uniforms by no lesser person than our old mate jumpwings. Whatever you say about him he certainly brings up some interesting topics. Now I got mixed feelings about this.I done in the correct manner and scenario I am sure it would be fantastic. On the other hand done badly out of context then it would be the joke of the year! Now personally I feel that children are an asset to some displays,however this then bring in to question concentration spans and disipline. So equally we then say is it the Parent who sets up the child in a scenario who's integrity is in question. Combat Scenarios ,Russian Front yes children would be with both sides .The Russians would have the Sons of the Regiment,the Germans would especially later in the war have refugees tangled up with them.NW Europe, might have a few girlfriends and thier children with the reteating rabble that was the German Army after the battle of Normandy. In places like Arnhem the civilians again got tangled up with troops. But I suspect in Europe I would expect to see the children dressed in clothing appropriate to the nationality they portray. Not Kids dressed up as Mini- Mees. Is the Mini- mee syndrome either a bit of family bonding or cheapskating on babysitting? Yes there were uniforms made for children to dress like Dad,Mom,Uncle or Auntie,these were sold on the home front market, not to issue to the children and ship them overseas to Dad so they could share his foxhole.Get a grip of youselves!!!!! Now by saying that would it not be historically correct to have Hitler Youth dug in with older Veterans waiting for the Russians. I know it's the old Hitler Youth Chestnut,but you could not fault this logic and recreation value of a snapshot in history. Well guys what do you think ? Are Children in displays acceptable if in context? Is it OK for Mini-Mees to dressup and sit around in foxholes with Dad or worst scenario still running about out of control playing soldiers ,shooting at everyone in uniform with a cammoed plastic gun? Do home front displays lack something if children are not involved?? Is it better just to leave kids in thier modern clothes and the other side of the rope? Well my opinion is if the child is well disiplined enough and interested enough to portray a credible part of a display,what's the problem? On the other side of the coin if a child is annoying other reenactors,running amok,then it is highly likely the father/mother has little interest in the child or thier own credability as a reenactor. "We know you don't like us, but we don't care" Millwall F.C. Post subject: Re: Children in Reenacting, asset or liability! adults in battle scenarios no. Same goes for women too, in my book. I once had an American Helmet liner converted to a Childs helmet, these were done at the factory to liners that did not pass muster and were sold as toys. (I donated it to the Bletchley Park Toy Museum) I have also seen a catalogue completely of American Childs uniforms. I know most countries produced the same kind of thing; it is well documented and nothing new but very much part of WWII History. Should we be seeing lots of kids at events dressed in "Mini Me" uniforms of Allied and Axis forces, well IMHO NO! I have had to in the last couple of weeks let down two potential recruits to the group because they fall below the minimum age limit to join the association. Personally if having had to let young lads down who were keen and had the gear, I am hardly then going to encourage existing members to bring very young kids dressed in copycat uniforms am I. If I had a member who could only come and attend if he /she brought her child, Id rather they stay at home to look after that child. Historically yes these Uniforms were purchased and parents, especially mothers left at home while their Husbands served dressed their kids up as Soldiers and Sailors (Sailor uniforms especially were popular) HOWEVER THEY WERE AT HOME, IN OTHER WORDS ON THE HOME FRONT and not on the front line with dad assaulting a bunker or in a chow line. We are looking at very young children here! 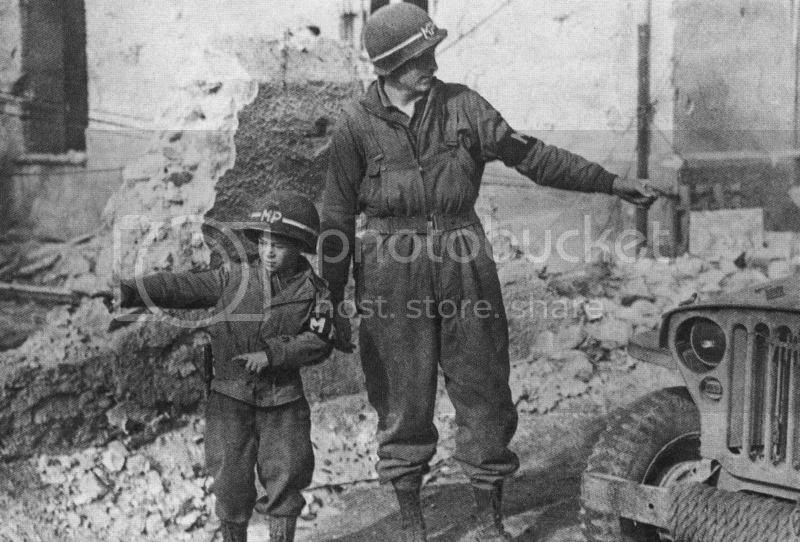 A homeless orphan until "adopted" by G.I.s, this Italian youngster proudly wears his new outfit of modified Army issue as he directs traffic through the town of San Vittore in his new job - honourary MP"
"In the fall of 1943 the 36th Infantry Division marched forward through Salerno. As they rested, Staff Sgt. Claren 'Curly' Thompson befriended a young Italian, Johnny Camera, who was working nearby. Johnny had been moving from place to place under the assumption that his family had been killed. Thompson took 11-year-old Camera in and the soldiers accepted him as one of their own, giving him a uniform. Johnny stayed with the division for 11 months during its campaign across Italy. During that time, Thompson promised Johnny that if he ever made it to America he'd have a home waiting for him in Texas." borderline personality disorder.] The character displays the behaviors of impulsivity, emotional lability, frantic efforts to avoid abandonment, frequent severe anger, changing from idealization to devaluation, consistent with the diagnosis, although generally aggression to the self rather than others is a more common feature in borderline personality disorder. old man flat caps, baggy 1980s leather jacket , old grand dad shirt, and denim jeans (aye, we all know they had jeans, but they mostly wore dungarees) in any case, a modern tiny wee turnup? The reality is, my 15 year old son toils to get a uniform to fit him as he is too big!!! so provided he acts the part, he is in. he is not allowed in any battles though (obviously). We also have quite a few other under 18's, to refuse them on age rather than how they look is....frankly stupid and short-sighted and may explain why some groups get, and keep, more recruits than others (and still look the part), if they look like little kids then fair enough, if not, be thankful they are keen and want to be involved in the hobby and (speaking from experience) will stay in the hobby. Your partly right, but for insurance purposes we dont have under 16 year old children attending events, unless that is they are acompanied by an adult and that adult has to be a fall time member. But I make the decision if they look right or not. On some , not many, displays we have had minors, but mainly these have been in civilian kids stuff and hung about the cook house. But these senarios are Home Front based so can fit in. The photo above is not a new picture on the circuit, I have another two similar, one of this child and another seperate one, but this does not illustrate that every unit had a child so dressed and this unit certainly wont. If a members son, daughter is not far off the min age to join , but looks older and they do dont they, then fine, thats down to the unit concerned, but I think we are looking at very young kids here in "Mini Me" outfits! How old would you say that lad in the picture is! That kid in the picture above aint no 15 year old kid mate and that MP there aint worrying about PLI cover. Your lad might very well be gagging to get involved and no doubt you are too, but what does the rest of the unit say, thats the point I think Gordon is making. Gordon is indeed reffering to CHILDREN - not Teenagers. kids that look like kids. not 6 foot 14 year olds. I mean look at the trouble he got into being pictured in the turret of an M18 Hellcat at the Victory show one year by some interfering nosey bloody "busy body " on this forum....but in his defence he is more armour aware than some adults to be fair. I know things are different now and i am also not condoning "crowbarring pre pubescent teens into uniforms" to swell unit displays and memberlists...but as i say schooled right and educated right...our children are the hobbies future. Could you post the other photo? I don't think Gordon is suggesting EVERY group does this, but as the photo demonstrates IT WAS DONE. Again LLoyd I dont think its the public we are discussing here mate, they can do as they like it seems, but that does not mean we have to dress our members kids up to make the numbers up. I dont like seeing MOP's kids dressed as you describe any more than I like seeing a 6 year old dressed up in "Mini Me" DPM carrying a toy SA80 gun at shows, buts that just my opinion which I would have to also say relates to seeing a Forceman "Cadet"
If it works for the group then fine, but it dont work for me in my group or an event I was running, but again its only my opinion, no doubt supported by those with no kids or those wanting to get away from the kids on the weekend and not supported by those who can not get away from the kids so have to take them with them! What is true, is the youngsters are the future of the hobby, but lets be sensible about it! I am probably one of the rare ones where my son convinced ME to get involved and not the other way round, he is now just turned 21 and has more original kit and weapons than most groups have (and a half track), however he doesnt come on here after someone had a go at him years ago for having the cheek to ask about weapons when he was only 17. This thread is fast turning into one that would put other youngsters off. It is difficult if good members have children of an age where they can't be left on their own. The parent comes to an event and the children have to come too. However, that does not mean that they should be involved/engaged in activities within a groups display, unless appropriately attired and with a role to play. If our group is meeting for a training session, or private event, we don't mind 'Minimees', in fact if it gets the 'steam' out of them running around dressed as 11yr old 'squadron Leaders' (sorry pet hate of mine) then fine. But, at a proper event, they must either conform to home front dress, or stay away from the display areas. In fact in the 'Plastic Camping area and play with their x-boxes etc. is fine by me. That sounds harsh, but we all try so hard and spend so much money, trying to look 100% and it only take one incorrectly dressed child to screw that all up. God, I sound like a mean old sod, I hope people understand where I'm coming from. Personally, I think if you make them wait until they are old enough, they will appreciate the opportunity all the more.